When my brother bought his five-year-old son a skateboard, I knew he was really buying it for himself. He did a fair bit of skateboarding when we were teenagers, but the late-thirties/early-forties body doesn’t take so well to skateboarding accidents and so the new skateboard came with some unexpected bumps and bruises before it was handed over. For all those parents wanting to relive their skateboarding glory days, Quinny has just thing for you. 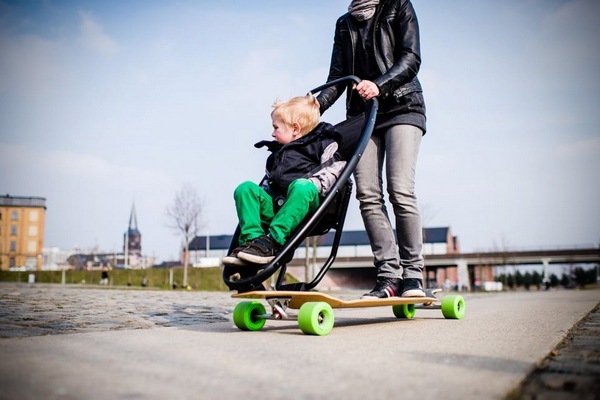 The Longboard Stroller is a collaboration between Quinny, the masters of the compact urban stroller, and Studio Peter Van Riet. 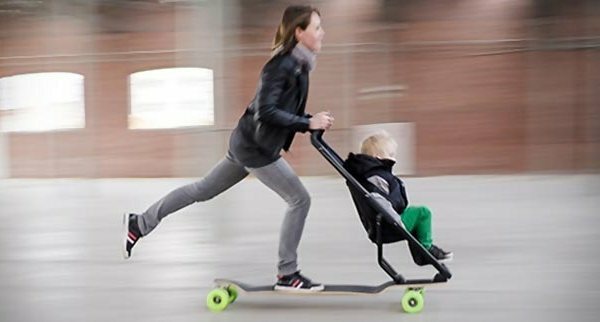 It’s essentially a pram/skateboard hybrid giving modern urban parents the freedom to move in a different way. And let’s be frank, a much cooler way. For the time being, overlook details such as brakes, helmets and hills and enjoy the fact that Quinny are testing all sorts of ways to make mobility fun (for parents and kids). The Longboard Stroller is still in development stage (the videos below show that the ‘development stage’ is a blast) but keep an eye on the Longboard Stroller page for updates on project progress – you might be rolling soon.